Say the word – “Root Canal Treatment ” or “RCT” and most patients pale a couple of shades. The pain/discomfort of an RCT is so well known that hardly anybody is willing to undergo the procedure without a great deal of coaxing. Specialist dental care offers painless root canal surgery in Mohali. Basically, the best root canal treatment/surgery in Mohali and Chandigarh allows you to retain a tooth in your mouth and serve you for a good many more years. The only other alternative to treat a tooth indicated for RCT is to remove or extract it. Many patients think that removing a tooth is easy and a cheaper way out. However, not only are they wrong about it being the shortcut but it generally turns out to be more expensive too. A natural tooth is a natural tooth. Ask anyone who has had to live with artificial teeth, therefore every extra bit of the effort that is taken to save a natural tooth is worth it. Including rest of the teeth, we have saved even 3rd Molar by performing successful root canal treatment in it!!! At Specialists Dental Care, we provide you best root canal treatment in Chandigarh, Mohali and Panchkula. Further, the crown is then placed on the tooth prevailing any further wear and tear of the remaining natural tooth or the sealed pulp. 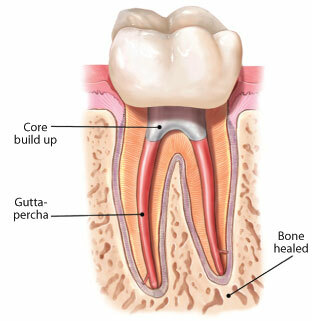 So, if your tooth is indicated for root canal treatment, get it done today!! !